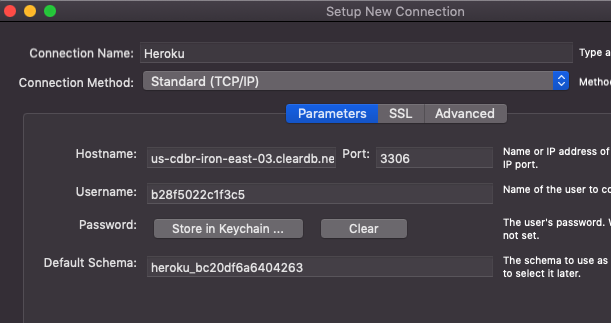 How can i perform a remote connect to ClearDB MySQL database on heroku using for example MySQL Query Browser. Where to get url, port, login and password? In heroku website, go to My Apps and select the app on which you have installed ClearDB. On the top corner click on Addons and then select ClearDB MySQL Database. Once there, click on your database and choose the 'Endpoint Information' tab. There you see your username/password. The URL to the database can be acquired by running heroku config --app <YOUR-APP-NAME> in the command line. So basically you just look at your own url and get all you want from there. That's how i set up mysql workbench. After this you will get Database URL. e.g this is your cleardb database URL. You can use this one-liner to connect to your MySQL database in your terminal. Go to your app on heroku and click to the 'settings' tab. Then click the button on the second option that says 'reveal config vars'. So the [host portion] is your host. The [database name] portion is your db name, of course. You still need your username and password. Go back to the 'overview' tab in heroku. Go to the ClearDB add-on in your installed add-ons section. Click the database you want to access (probably only 1 option there). Click the 'system information' tab. You should see your username and password. that should be all you need to access your database. I use sequel pro. I just plugged that info (name, host, into the 'standard' tab and I was good to go. All of this worked perfectly for me. Using heroku config | grep, as described above and then simply adding another entry into my config.inc.php for use by phpMyAdmin and I can access my cleardb database remotely. It saves me having to have SQL locally and using postgres with Heroku. If you are using mySQL workbench, follow this schema. Go to Heroku > Your Applications Settings > Config Vars, and show the long URL. That url includes your username, password, the URL of the database and the default schema. Paste all of the information as follows below, and you will be able to successfully connect to the database. There was no real explaination on how to connect to ClearDB using mySQL workbench on this thread, so hopefully this helps someone who was struggling. Yes, you can connect to ClearDB directly, actually I use Workbench to connect. Then you can use the same DB for your localhost and for heroku. Not the answer you're looking for? Browse other questions tagged mysql database heroku database-connection or ask your own question. How to make a backup of a Heroku ClearDB MySQL database?